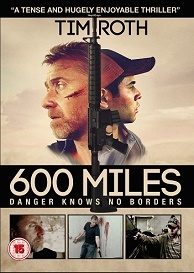 600 Miles is out on DVD on the 30th May, and to celebrate we have a great competition for you and 3 copies on DVD to give away! Mexican drama starring Tim Roth and Kristyan Ferrer. When ATF agent Hank Harris (Roth) tries to arrest weapon smuggler Arnulfo Rubio (Ferrer) he finds himself captured by Rubio, who decides to take the agent to his employers - a Mexican cartel. Over the 600-mile journey to their destination, however, the pair bond and strike up an unlikely friendship.